Virtual Image Gallery world's first gallery dedicated exclusively to lenticular imaging. Opened in May, 1992 & located at 122 E 27 St. 2 fl. in Manhattan, NY. 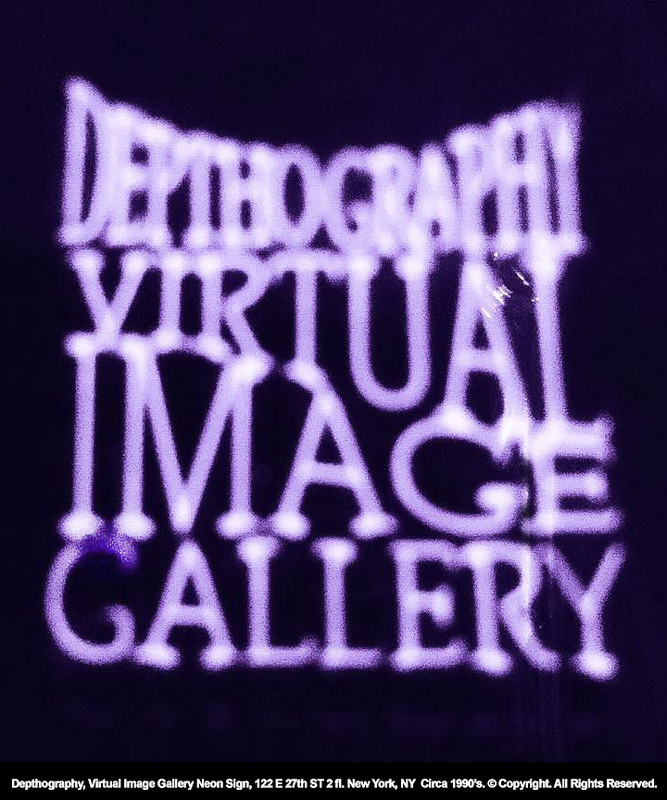 Depthography's Virtual Image Gallery was the world's first gallery devoted exclusively to the lenticular medium. Robert Munn & Sara Cook were a few of artists featured at the gallery's premiere. For over six years, this gallery premiered Depthography's technical breakthroughs & it was the epicenter of a multitude of exciting events. By utilizing various forms of stereoscopic presentation, true visual spectacles were presented to a public eager for interesting, unusual experiences. First & foremost, it was where Depthography premiered artworks utilizing advancements in 2D animating, 2D into 3D, & other achievements in 3D & 4D lenticular methods & stereo imaging. The many fine examples featured were the work of the artists that comprised The Depthography Group, & collaborative efforts of note. Foremost among these collaborations was our experience with the famed Swiss artist H.R.Giger. This work was incorporated into Giger's "Hommage to Nicholas Hayek," which was exhibited simultaneously in New York & Geneva in Nov.'93. On exhibit at the Virtual Image Gallery was also an unusual 4D portrait of the artist Giger, seated in his famed black "Giger Chair". The technology utilized in the Giger portrait can be seen in Depthography's "Autostereoscopik" 3D image created in 1990 & Depthography's 4D Bellydancer image "Siren Genii" that were both showcased at The Virtual Image Gallery's opening in 1992. There were also pioneering 36 frame animating, 3D & 3D animating (4D) lenticulars premiered at this event. The gallery also featured various 3D themed projection shows, Robert Anthony Munn's 3D short films that included stop action animation techniques & the gallery was also a prime staging site for many 3D stereo projection art shows including some with live multi-media musical & dance performances. As The Depthography Group continued to create & reveal new breakthroughs in technology, more artwork was added to the collection on a daily basis. While various methods have been used to try & give you an idea of what was witnessed at this historic gallery, NOTHING was an acceptable substitute for seeing the actual lenticular & stereo images as they were first pioneered & how Depthography's advancements stand up today in TRUE 4D. The Depthography Group are artists, technicians & technology pioneers including Robert Munn, Sara Cook, Arby Schuman & Dan Preda along with other artists they choose to collaborate with via Depthography in this exciting new medium.